MAP: goals and visions are needed to get where you want to be. Each of the chapters provides examples and anecdotes illustrating the topic at hand. Most of them are taken from the analog world on purpose: You don’t need to be a digital native to become a digital leader. 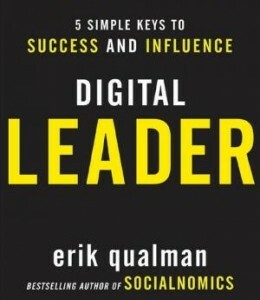 A leader is a leader, and anybody can become a digital leader. Social media is not some form of black magic that obliges you to become somebody you are not or do not want to become. Rather, it is an environment that invites you to find the quintessence of who you are and what you want to say in order to be understood and interesting. Make technology work for you! The content of leadership may not intrinsically be different from what it is in the physical world, except that you must make your messages even more zen in order to render them more effective as well as more universal (and show a heightened sensitivity to the diversity of the people that constitute your digital friends or followers). Leaders, whether analog or digital, define their goals, pick their fight, shape their paths in order to shape the path of others. One of the remarkable qualities of the book is that it dispels the threat that social media still signify to many people. Qualman is not lecturing you into becoming social media addicts to survive. Instead, his tone is inviting: “Digital Leaders are Made—Not Born.” Any individual can thrive in the digital era by creating output that unites people instead of dividing them. A very good book! Very human. *I wrote a post about Socialnomics at the end of 2009. This is a great overview! I’m going to be reading this book in April as part of the http://www.12booksin2012.com book group. Erik Qualman will be leading the discussion personally! I agree with Jacob, very clear and awesome tips Erick! Having two identities only helps increase uncertainty and in today’s digital world, certainty is a must.